Hello, I have a 2006 315 and would like to fit an extra rope clutch on the Port side. Has anyone done this and before I start cutting a hole in the moulded headliner in the heads could you advise on whether there is a backing plate under the existing clutch pad? 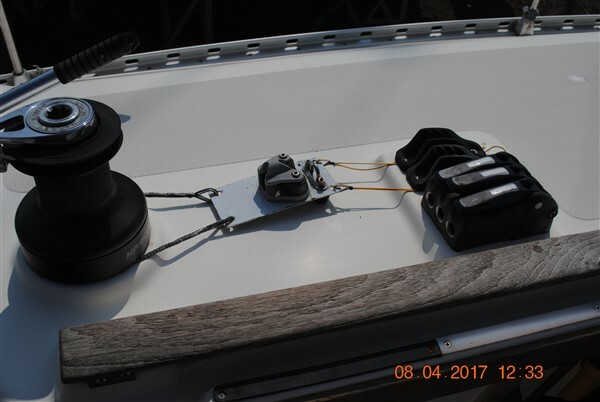 This afternoon I removed 2 of the clutches to change the size of the plate in the bottom to accommodate the thinner dynema halyards which are starting to slip. This is the first time I have done this. The countersunk machine screws are 35mm * 6mm. I was somewhat concerned that one did not seem to have any " bite" whatsoever & the others only just engaged into the aluminium plate on the last 2-3 turns. I got the impression that most of the gripping power was from the mastic around them. Tomorrow I will take a 6mm tap to the boat, clean the threads & try some new bolts in the holes to see exactly how much they engage into the aluminium plates- If at all. I had a similar problem with the pulpit when I found 8mm nuts fitted to 6mm studs with copious amounts of mastic because some operative has been too lazy to tighten the correct nut up in a difficult position. Preferring instead just to push an oversized nut on to the stud. I had the same problem! In the end I took a piece of thin mousing wire and put a right angle bent in it. By pushing it down the tapped hole you can find the bottom of the metal plate - that will give you the screw length you require! So sorry I didn't reply to this sooner I've been offline for a few months. Anyway thanks samuel and grumpydatagit for all you helpful advice. Another job for the winter!